Listening to Tom Judson talk about France is like hearing a fairytale custom-made for cyclists. Steep, twisting climbs and challenging descents, beautiful scenery, mild weather, reasonable road surfaces. Miles upon miles – or kilometers, rather – of epic riding that the most famous names in cycling have traveled, where you can say, “Here’s where Carlos Sastre attacked in 2008,” or “Here’s where Eddie Merckx came across the line in 1970.” And also, a culture where the bike is neither an unwelcome enemy nor a stranger, but a celebrated and integral part of sport and society. Every summer when Texas temperatures are at their hottest, Tom leaves for a 3- to 5-week pilgrimage out of the country. This summer will mark his fifth cycling vacation to France. He always makes the trip completely under his own steam, traveling alone and deciding his own itinerary. Originally a California native and later living in Illinois, Oregon, Washington, Colorado, Massachusetts, and again in California, Tom moved to Nacogdoches in 2008 to teach math at Stephen F. Austin State University. In his 30s, he was active in competitive track and road cycling from 1984 to 1993, but didn’t begin training seriously again until 2006. Now 63 years old, he’s one of those riders you see out on any day in any weather. Tom was one of the first master’s men to prove to me the danger of estimating speed and fitness by the number of gray hairs. I met him a few years ago, when I was just getting started in road cycling. 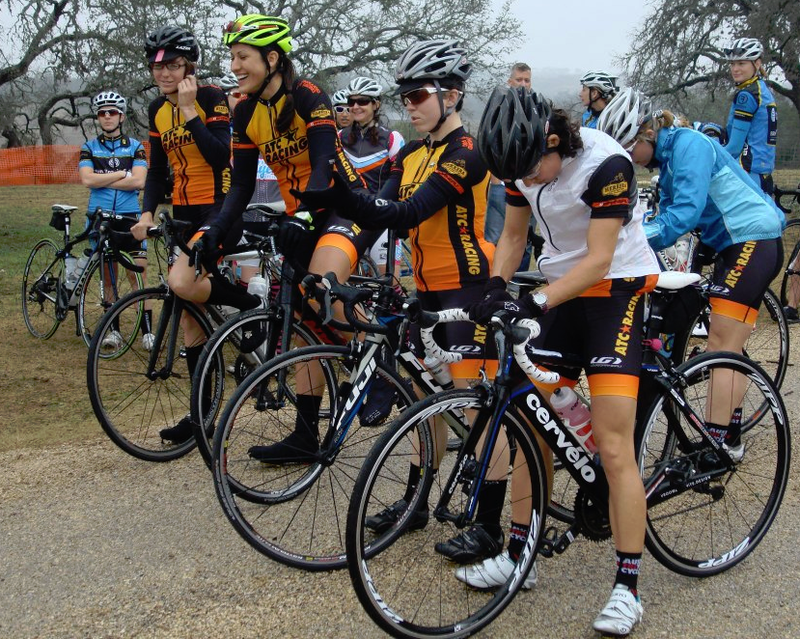 On visits to family near Nac, my husband and I often tag along with the Nacogdoches Cycling Club’s Saturday ride. Tom is one of the ride’s devoted regulars, as well as a member of Nac Velo-the Bike Shop’s racing team. Providing inspiration for cycling’s everyman, Tom is not a pro rider, millionaire, or retiree. The luxury of traveling is made possible by careful planning and his profession as a college professor. The fact that he’s not married doesn’t hurt anything either, he says jokingly. Read on for some of Tom’s tips on route planning and travel in cycling’s Promised Land. 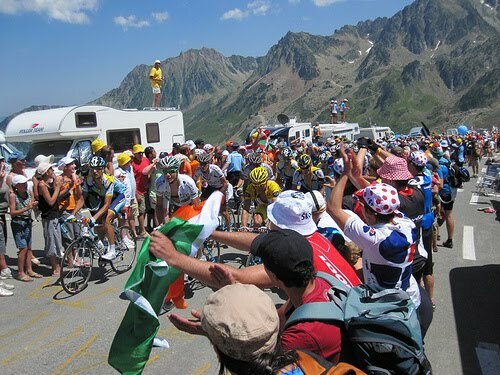 Alpe d’Huez, Hautacam, Col du Tourmalet, Col de la Croix de Fer, Col du Galibier...the climbs roll off the tongue like a list of classic European celebrities, which is true in a sense. You can spend weeks traveling the same scenic, demanding routes made famous by the Tour de France, though Tom says you might not want to limit yourself to only those. 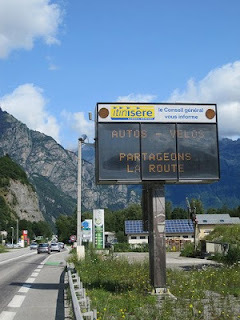 In a nutshell, he says the Ariège or the Circle of Death are the best places to ride in the Pyrenees. He recommends Albertville as the best in the Alps. And while Le Bourg d’Oisans, Briançon, Barcelonette, and Saint Jean-de-Maurienne have some great rides, he says in those locations you’re more likely to exhaust the possibilities. In subsequent years, planning out his trip was much easier. He often returns to La Lanterne Rouge, a cycling lodge in Saint Savin operated by an Irish couple. “It’s in the center of the ‘Circle of Death.’ From that particular place, you can go to the Tourmalet, the Aubisque, the Sulour, the Luz Ardiden, Hautacam, all the big climbs in the Pyrenees that you’ve heard about in the Tour and then a bunch you haven’t heard about, some of which are even harder. You can spend two weeks there and not run out of new climbs to do.” He also recommends Les Deux Velos in Biert. While speaking French is certainly very useful, in most places you can get along with a travel dictionary and a smile. Many travelers and lodge owners speak English, and plenty of reasonable accommodation options are available from 60 to 100 euros a night, with half- or full-board included. It’s worth it to research your route well, and many websites list out cols in detail. You’ll find challenges you’ve never encountered before, and being prepared for them, or being able to avoid them if necessary, is important. For example, how comfortable are you with technical descents? Or blind, narrow hairpin turns? Are you prepared for the difficulty, the exposure, the return trip? The possibilities are nearly limitless – you can plan an out-and-back, a loop, or sometimes multiple HC climbs (the term used in the Tour de France to describe a climb so difficult it is “beyond categorization”) in a day. Overall, cycling in France is very pleasant and safe. Drivers are required to give cyclists 1.5 meters (about 5 feet) when passing, a rule that is said to be strictly enforced by French police. Cafés and tourist restaurants often cater to cyclists. Most mountain passes are marked with signposts for cyclists showing how far it is to the top or how far they’ve gone, along with the average grade for the next kilometer. 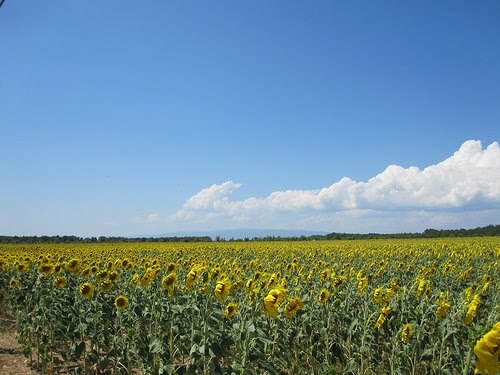 Many travelers include some celebrity-viewing in their summer cycling tour, riding up to a summit early to scope out a good spot before the Tour de France riders come through. It’s a party on wheels, with spectators in costume and free-flowing libations, and when the race caravan comes through, team cars often toss out free swag like water bottles, food samples, T-shirts, and noise-makers, although you’ll often have stiff competition getting your hands on the prize. This upcoming June 29 to July 21 is the 100th edition of the Tour, which is likely to draw even larger crowds. 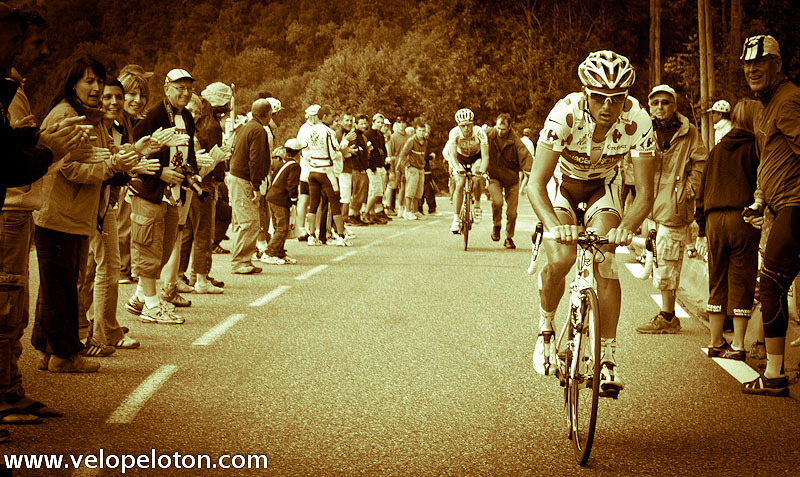 Tom plans to catch Stage 15 up Mont Ventoux, as well as a handful of stages in the Pyrenees and the Alps. He’s witnessed five stages of the Tour in the past four years. He was there when a stitched-up Johnny Hoogerland made the climb up to Luz Ardiden in 2011, and watched Fredrigo and Pellizotti come over the top of the Tourmalet in 2009, Pellizotti zipping up his jersey on the way down the steep descent. When I asked him about the favorite things he’s seen and experienced in his travels, however, Tom said it’s the people he’s met and friends he’s made. One of the advantages of traveling alone, he says, is the fact that all the people you meet are new. Alpe d'Huez and Col de Sarrene. The climb up to Alpe d'Huez really isn't that much fun, but once you get past the Alpe, the continuation up to the Col de Sarrene is beautiful, with fantastic views. Tom has done this route twice, and it's on the agenda again for this summer. Any ride in the Circle of Death. This is the set of climbs that can be reached from Argeles-Gazost and Saint Savin, including the Col du Tourmalet, the Col du Soulor, the Col d'Aubisque, the Col de Spandelles, Hautacam, le Cambasque, Luz Ardiden, Port du Boucharo, Pont d’Espagne, and Cirque de Troumouse, to name a few. You could stay in this area for two weeks and not run out of new climbs to do. 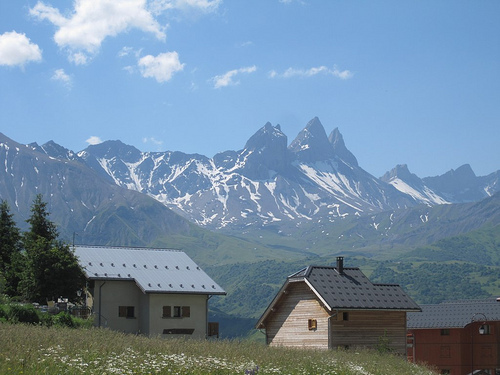 Tom recommends cycling lodge La Lanterne Rouge in Saint Savin. Ariège Pyrenees. 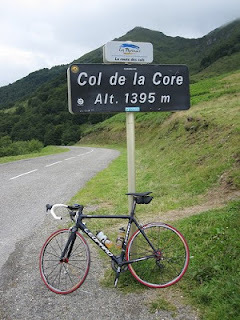 If you stay in Biert (Tom suggests the lodge Les Deux Velos), there are many possibilities for rides, including Col d'Agnès, Port de Lers, Col de Latrape, Mur de Péguère, Col de la Core, and Plateau de Beille. Riding in Haute Provence near Moustier-Sainte Marie. There aren't any famous climbs here, but the scenery is gorgeous, with lots of back roads. The lavender is in full bloom in early or mid-July. Barcelonette. This area has seven famous climbs, including the Col de la Bonette, the highest paved pass in Europe. 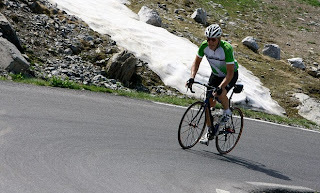 Col de Cayolle, Col d'Allos, Col de Vars, and Col des Champs are all great routes. Briançon. This makes a really nice 70-mile loop, consisting mostly of back roads, that goes from Briançon to Guillestre and then over the Col d'Izoard. 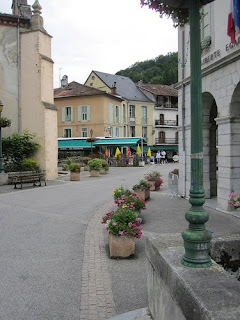 Le Bourg d'Oisans. This area attracts many cyclists and has some famous climbs, but is somewhat overrated. The good climbs include Alpe d'Huez and Col de Sarenne and Col de la Croix de Fer. You can get to the Col du Galibier via the Col du Lauteret, but are probably much better off doing this route from the north side. From this side there is a lot of traffic and long tunnels. (See “Saint Jean-de-Maurienne” below.) There’s also a nice route that goes down the main highway toward Grenoble and then turns off to go over the Col de Morte and back to Le Bourg d’Oisans via the Col d’Ornon. Once you turn off to the Col du Morte, there is very little traffic. Saint Jean-de-Maurienne. Tom recommends a stay at Hôtel Saint Georges. From there, it's easy to get to the Col du Télégraphe and the Col du Galibier. This side is harder than the other side that takes Col du Lauteret, but the route has less traffic and tunnels. There is a beautiful loop that goes up the Col du Mollard over the Col de La Croix de Fer, and then descends back to the valley by the Col du Glandon. Other possibilities include the Col de la Madeleine and La Toussuire. Chambery. This is a fairly large city, but there are a lot of possibilities, including Col du Granier, Mont Revard, and Mont du Chat if you are feeling really energetic. Mont du Chat is mostly 9 to 11 percent for all but the first few kilometers. Any ride around Albertville. This is the best place to ride in the Alps. It's another location where you could spend two weeks and not run out of new rides to do. Ride possibilities include Col de la Madeleine, Cormet de Roseland, Col des Saisies, and Col de Tamié. There is a really nice loop that starts in Ugine and goes over the Col des Aravis, the Col de la Croix-Fry, the Col du Marias, and finally the Col de l'Épine. Get Fit. Are you ready to climb for five hours and still call it a vacation? If possible, consider throwing in a little altitude training. Book Flights Early. For a summer trip, you might want to book as early as November or December. The optimal trip duration is probably 10 days or more. 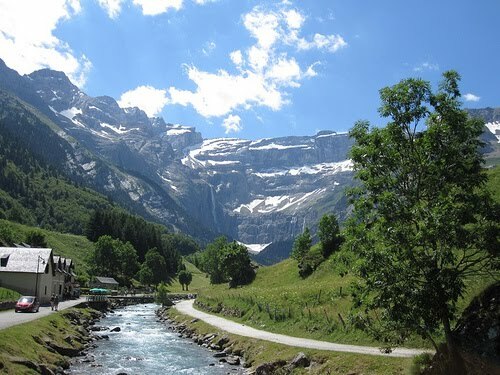 Consider Geneva as a starting point for the Alps and Toulouse for the Pyrenees. Factor in Bike Charges. Most airlines now charge for bicycle transport. Air France currently charges $150 to and $133 return. KLM charges $150 to and approximately $280 return. Additional fees apply if the bike+box weighs more than 50 lbs. Plan Out Car Travel. Depending on the length of your trip, leasing a car can actually be less expensive than renting one. Sometimes leasing comes with the perk of zero deductible insurance. Cycling in the Pyrenees is relatively easy without a car, but the Alps are more difficult since trains don’t go there. Choose Tour or Self-Guided. If self-guided, research your routes carefully or you may get much more elevation than you bargained for. Soft bike case. A hard case might be difficult to get into your rental car or on the train. Tom favors the Pika Packworks. Lights. Even if you aren’t planning on riding early or late, always carry a flashing light. Many routes go through unlit tunnels or areas of heavy fog. One word describes this year's Team Wooly Mammoth's Ultra Provocatorio Gran Fondo: EPIC! The romantic chip seal roads of Fredericksburg were the ultimate backdrop for the drama that unfolded that day. 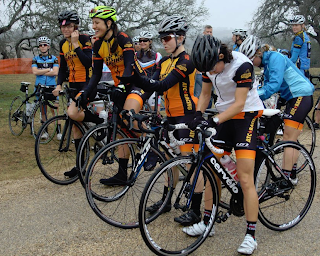 Yes, there was a magical presence at 9:20 a.m. when we rolled up to the start line in our new kits. A few spectators staggered back in admiration at the sight of the new, high-viz ATC orange jerseys. A Team Yacht Club racer hit the nail on the head when he remarked, "The orange to yellow fade out is reminiscent of Miami Vice." Indeed. Sock choice also played an important role in the overall performance of the team; long black socks solidified the roadie look. Frankly, I was a worried that if we did not wear true roadie socks that Missy and Marla might feel compelled to go for a run afterward. Rest assured, all we did was ride, ride, and ride. Kudos! These ladies co-navigated the entire course without a mistake. It was impressive to watch them glance down at GPS directions and cue sheets covered in plastic wrap, shout directions, and not crash. Lots of the roads were hard-to-pronounce German names that kept us entertained. Left on Weimaraner Rd??? After getting a little strung out on the initial climbs we settled into a steady pace line where we took turns in the wind at 1 to 2 minute intervals. Eating while on the bike is an art, an art that Lori has mastered. To say she is a pro would be an understatement. Even though she didn't feel like eating she knew from past rides that if she did not force-feed bars and gels down she would certainly run out of juice. On a side note, we apologize for any GU’s, bars, and chomps we may have "lost" in the attempt to open ridiculously wrapped packaging. A prominent racer from Team Ghisallo recommends: "Next time you should pre-open your snacks." Brilliant. Our strategy for endurance was to treat the first 50 miles like a warm-up. Beyond random remarks about livestock there was not much conversation. Our mantra: "Focus!" Gravel, mud, sand, and low-water crossings were some of the many countrified challenges of the day. Things got real once we hit the first patch of washboard surface. I hung on to the rest of my team until the first low-water crossing then we became strung out. We slid all over the place, and I had to walk my bike a few times. As a result, I had one shoe with the cleat cemented to the pedal and one shoe that would not clip in. After a few attempts to rinse my cleats I concluded, as I rolled up to the end of the rough section where I met with the rest of my teammates, that I would not be able to clip in for the rest of the race. I'd never been so happy to see someone in a car! Our very own superstar baby-mama Kat pulled up just in time to give water and nutrition to those of us who ran low. Having her there meant not having to stop, which would have cost us precious time. We dedicated the race to Kat, whose tiny baby bump is just starting to show. Mile 85: Sammi's Rapha cap, cramps & climbs! Sammi's black and pink Rapha cap reminded me of the title of one of the Rapha blogs: "Glory through Suffering." The last hilly section proved hardest for everyone. Lori was on the verge of bonking, Marla was suffering from really bad leg cramps, and Sammi was a little mad from being jostled over the rough washboard roads. My legs were screaming in pain from being left with no choice but to attack each hill in the saddle as I still could not clip in, and Missy, being the experienced leader that she is, kept spirits high. Those who had the legs gave longer, steady efforts in the wind, but everyone worked together till the end. When you take away the option to quit, it makes it easier to suffer because there is nothing to debate, you just go. That kind of raw riding is why I love cycling. Mile 98: Get me off this bike!